Holidays are a time for family, friends, and frantically baking for all those you love. Since starting this blog I've gotten a few requests to make things for family gatherings and holiday dinners, which is great. I love baking for people who you know will appreciate all the time and effort it takes. Either that or I'm just a fiend for attention, after all, I am a Leo! Either way, whether I'm baking for praise, attention or just to fill tummies with some sweets, it's all a win win situation! So when it when it came time to bake a for my own family's Thanksgiving dinner I went simple, luxurious and decadent. 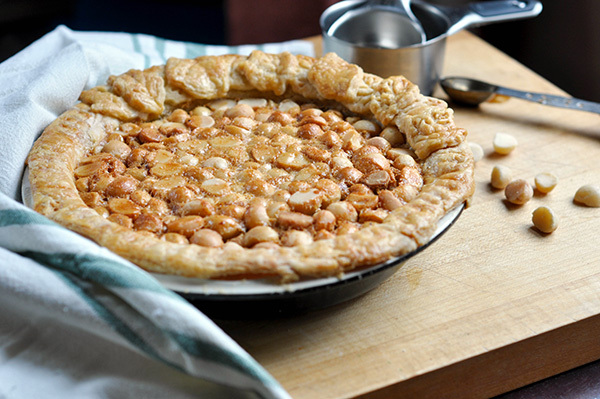 A Vanilla Bean Macadamia Nut Pie. I don't think I've ever met anyone who didn't like a macadamia nut. And if you macadamia nut haters are out there and reading this, I'm sorry, I just don't know how we can get along!? But back to the pie. So basically when I get ideas for things, I search the internet, seeing if someone else also had the same brilliant idea I did. That way I can develop a base to my ideas and read up on all the different ways people have tried to make it. From the list of ingredients, I can figure out the texture and flavor I want, and from there I add in my own spin on things. However when I came up with a Macadamia nut pie, I was only able to find about 2 or 3 recipes for it, and they were all about the same. It has a pecan pie base, sweet, eggy and a bit gelatinous. But filled to the brim with macadamia... yes please! I started with my new favorite pie crust made with half lard and half butter. It comes out awesomely flakey and flavorful. I laid this into my pie dish, fluted the edges and spread the halved macadamia buts all over the bottom of the crust. Then comes the glorious filling. Eggs, sugar, corn syrup, vanilla bean paste, butter get whisked together tin large bowl. I feel like to some non pecan pie eaters, this sounds like a strange and sickeningly sweet filling, but trust me, it's delicious. Pour this egg filling all over the nuts and bake for about 50-55 minutes. The nuts get coated in this rich, caramel-like custard. It's like the best roasted nuts you ever had. Allow to cool to room temperature and enjoy with a dollop of fresh whipped cream! This truly makes any holiday mean even more special. Pre heat the oven to 325F. Roll out pie crust and gently lay into pie pan. Press down , cut off any excess dough that overhangs on the pie pan, crimp and decorate. 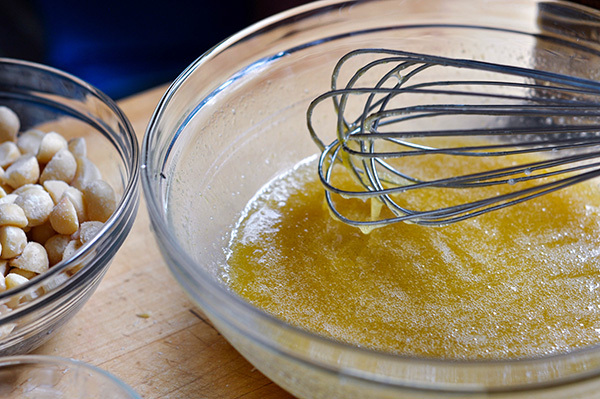 In a medium bowl whisk together the eggs, corn syrup and sugar until smooth. Add in the vanilla bean paste and butter and whisk till combined. Mix in the macadamia nuts. Pour this filling into your prepared pie crust. Bake for 50-55 minutes or until it is set. Allow to cool to room temperature (about 2 hours) and serve. Or refrigerate till ready to serve.